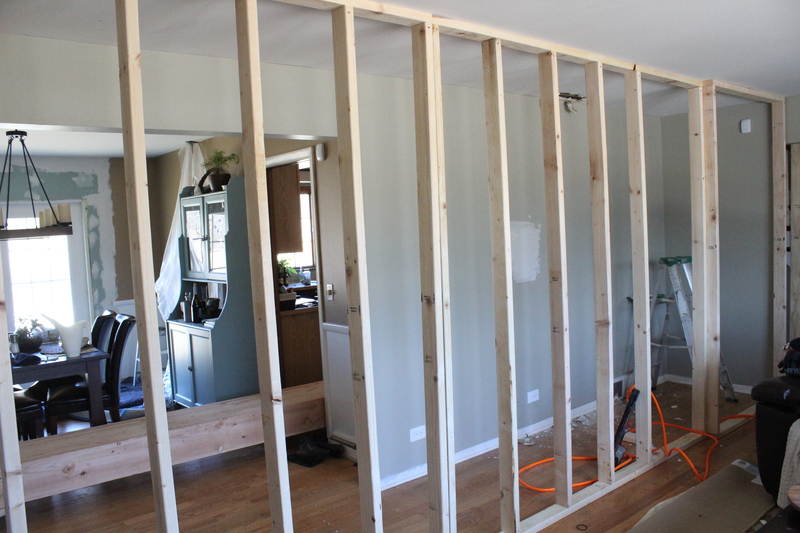 Time to show you how we took down the main structural wall separating our living room and kitchen to create an open floor plan. I’ll preface this by saying, “Don’t try this at home.” My husband Ben is a professional contractor. We also consulted a structural engineer who told us what was needed to support the house. The engineer told us if we wanted to remove the wall we either needed a column (boo) or a header. We went with a header which had to be 26 foot long, 8.5″ wide and 18″ deep. It’s massive. A whopping 1,200 pounds. Which isn’t a big problem for new construction, but getting it into an existing house was quite the feat. Luckily, Ben had the help of his friend Lee (we owe you, man!) Ben and Lee used the bobcat to lift it onto furniture dollies, and then used ramps to get it into the house. Next, they built walls on both sides of the existing wall that was to be removed. 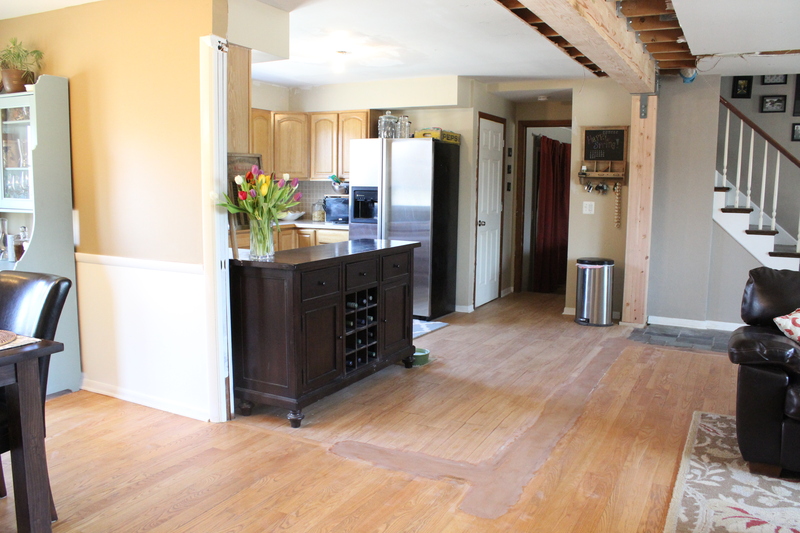 The walls would take the weight of the house once the existing structural wall was gone. They covered the new walls with plastic to protect the rest of the house from dust. Then demo began. 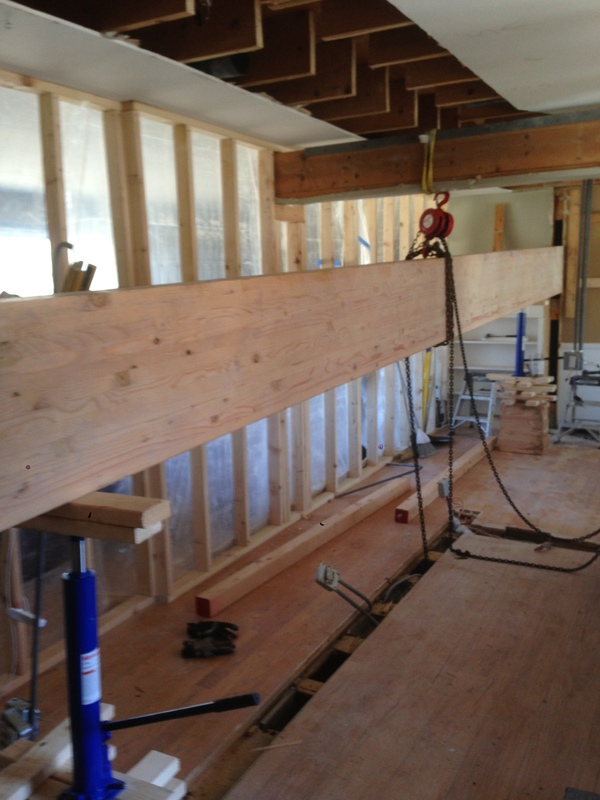 To get the mammoth header into place, they used jacks and a block and tackle to slowly inch it upwards to the ceiling. 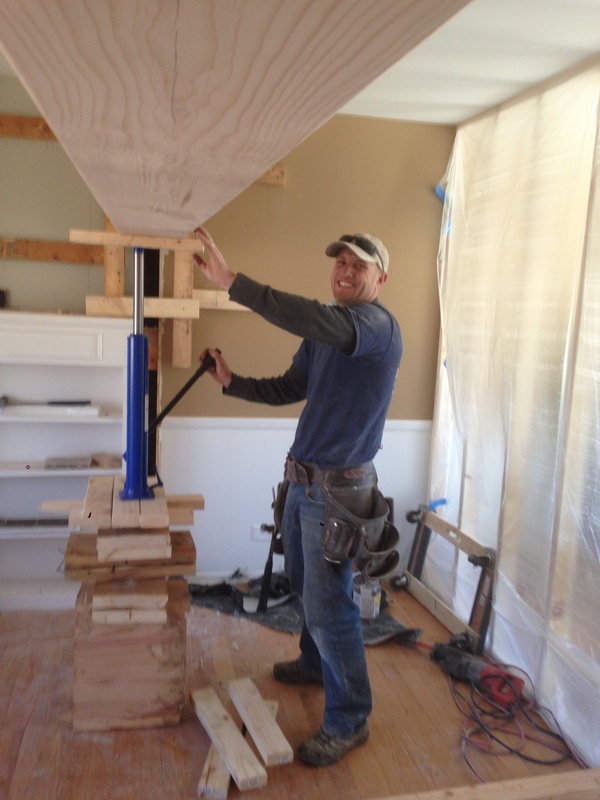 Look at that smile… Next came special made brackets and putting the posts into place. Finally, they took the temporary walls down and it was done! After that, Ben patched the holes in the floor where the wall was. 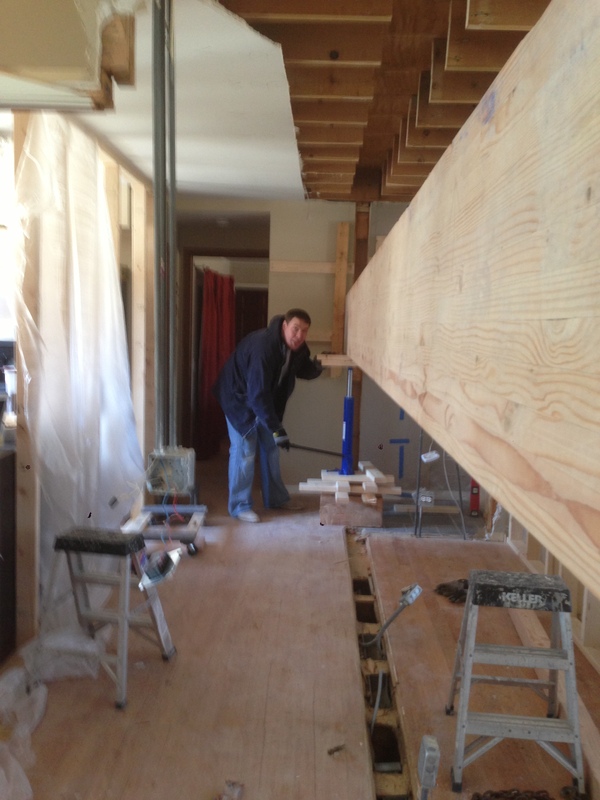 We also had the HVAC guy come out to re-route the ducts that were once in the wall. This is the view from the stairs: The buffet we have there represents where the future island/peninsula will be. So image it twice as deep with stools and pendant lights above. Plus we decided to make it 2-tier so you can’t look right into the kitchen at your dirty dishes from the couch. 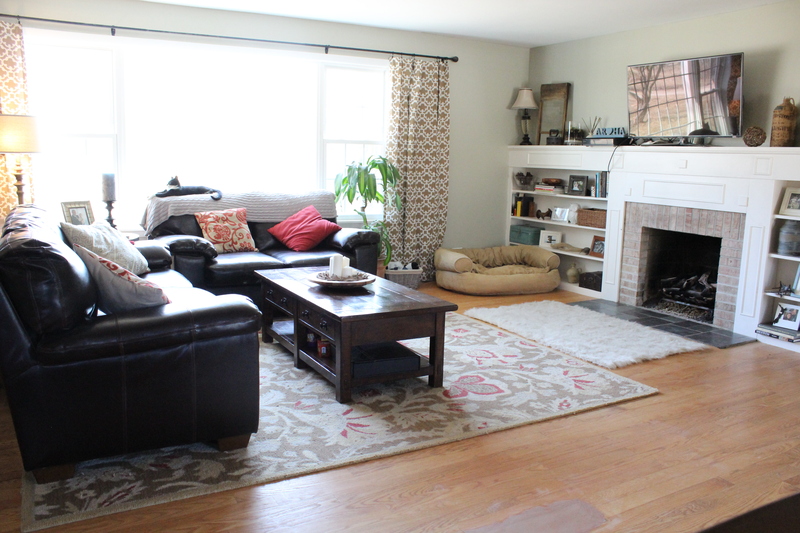 We also rearranged the furniture in the living room so the 3-seater couch faces the TV and fireplace. So much better! 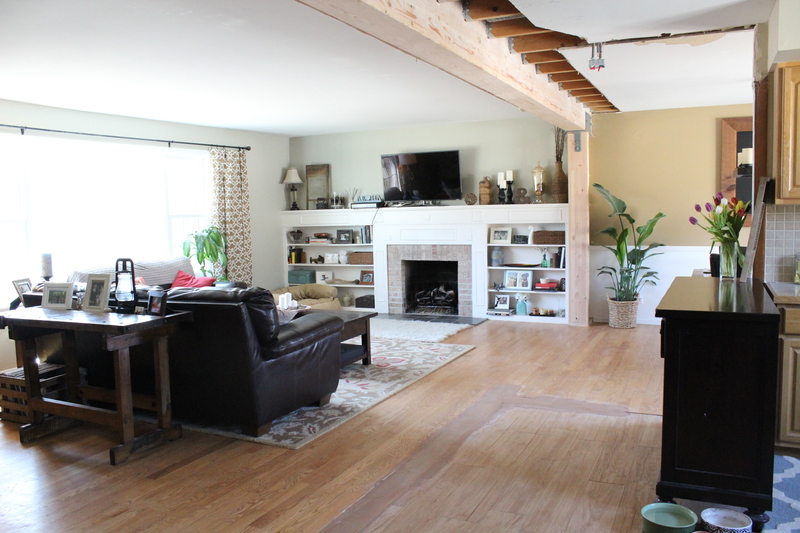 The next step is covering the beam in barn wood and creating some fake beams to go perpendicular to it in the living room. Plus adding can lights to them since there are no overheard lights in there. Then drywall. We also want to overhaul the built ins around the fireplace so they are cabinets on the bottom and then shelves extending to the ceiling. Savvy readers may also have noticed the new French doors in the dining room. I’ll be back with another post on those next. What do you think? Aren’t Ben and Lee amazing? 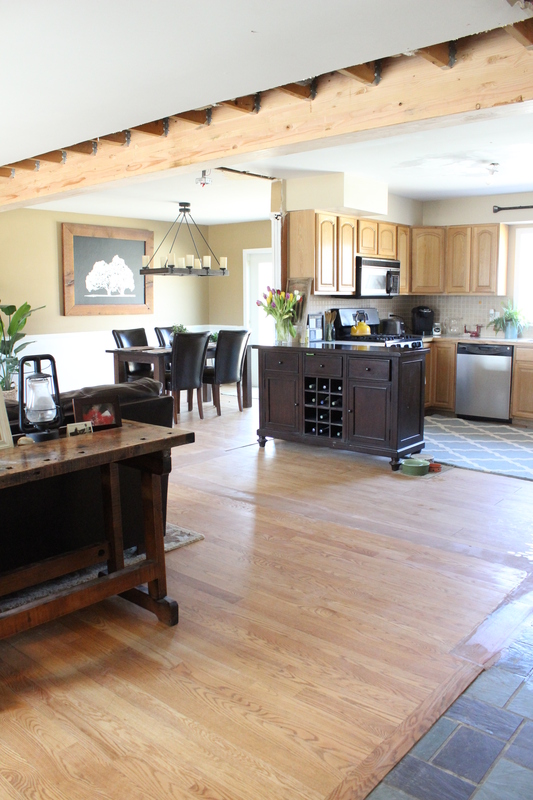 Can you envision it all finished with a beautiful open kitchen? We can, and seriously can’t wait. Totally addicted to your blog! Just found you today through pintrest and love your updates…and your taste. 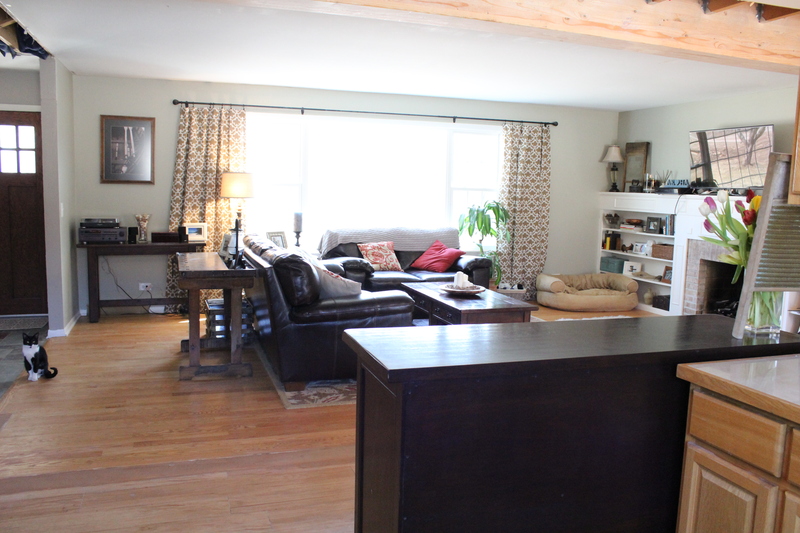 We remodeled our small galley kitchen in our small townhome a few years ago and this inspires me that we can totally find an old home and make it our own. Your work is amazing! Yay thanks Sue! So glad you found us. It’s amazing what a little elbow grease can do huh? Wow – it looks great! 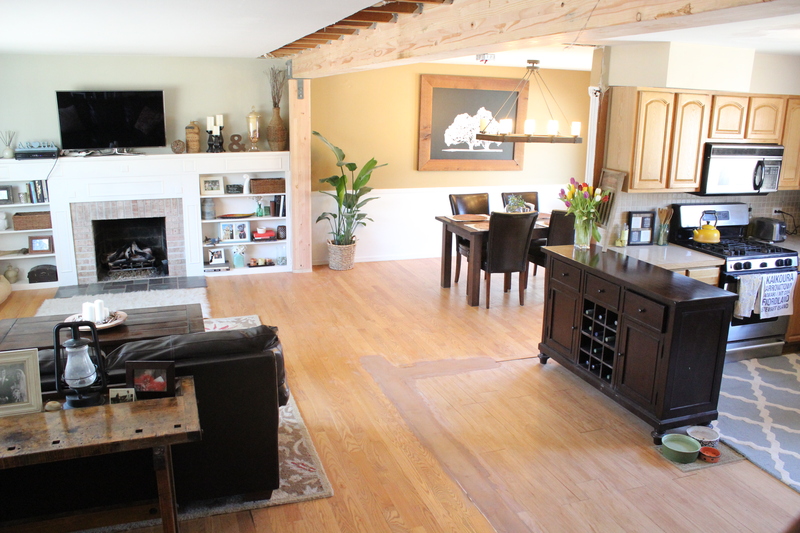 Totally opens up the space and makes it look like a whole new house. Fantastic job! Thanks! It was a big undertaking but totally worth it. I love the tree art in the dining room!! The wood frame is perfect. Can you tell me where you got it or how you made it?? Thank you!! We made it ourselves out of rough sawn cedar in 2x6s. Hope that helps! I love all of your paint colors…could you list them? Also, in your dining room, did you just paint it white under the chair-rail? I have a chair rail my dining room, and I want to do something similar to brighten things up. 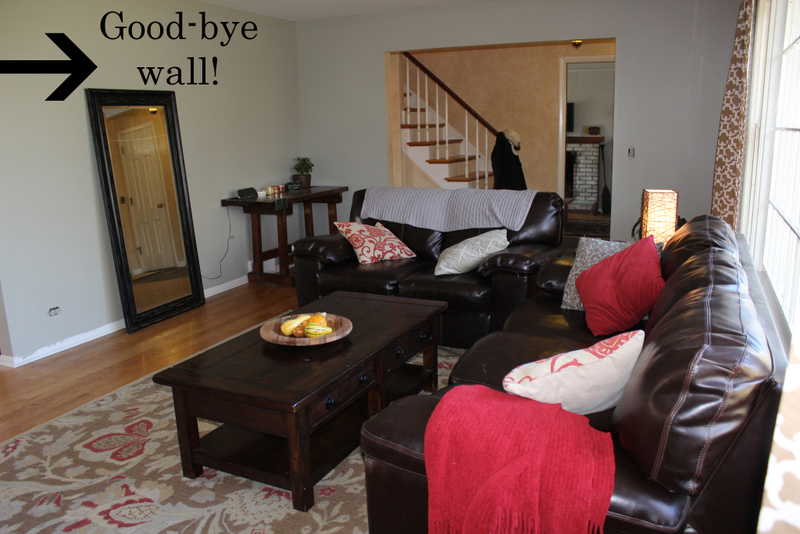 Beautiful changes you both have made to the house! Thanks Brynn! Yes, in the dining room we painted under the chair rail white (we plan to add shadow box molding too). Below is a full list of our paint colors. Thanks for stopping by! I just found your blog via Pinterest and your bathroom redo. I love your work!!! Inspiring stuff!! !